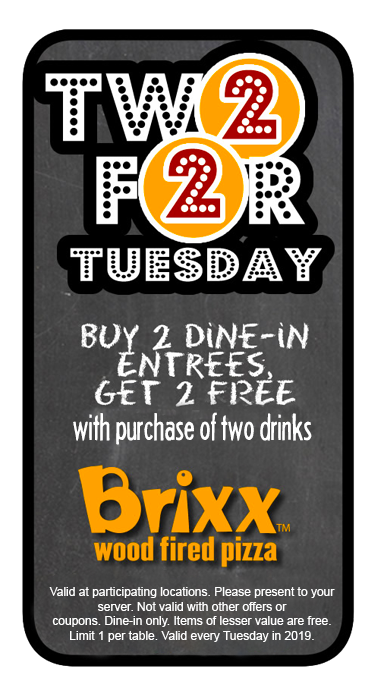 CLICK HERE for your Brixx coupon. Good at participating locations. Good only on Tuesdays. Print the coupon and present it to your server, or display it on your smartphone to redeem. Buy 2, Get 2 Coupon Terms: Dine-in only. Offer valid at participating Brixx locations only. Not valid with other specials, offers, coupons or vouchers. Must present coupon. Limit one per table. Items of least value are free. Brixx sent the coupon in an email to subscribers. Download the BrixxRoxx app and get a Brixx Pizza coupon for a FREE pizza with the purchase of a pizza & 2 beverages now through January 24, 2019. You can download the BrixxRoxx app at: Google Play (for Android devices) or Apple App Store (for iOS devices). After you download the app, enter your email address and the coupon will be displayed. You can also get the coupon later in your VIP Coupons tab. Show to your server to get the special. Dine-in only. Limit 1 per table. Valid 1/20/19 – 1/24/19. Brixx announced the pizza special on Facebook. “How do you stand apart from the competition big and small? Simple: just add fire. Finally, by offering local and national craft beers and microbrews with a great wine selection, Brixx gives you a fresh alternative to “pizza and beer." 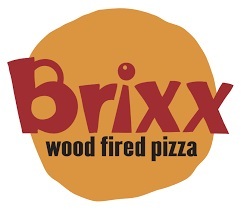 The first Brixx Wood Fired Pizza opened in 1998 in the historic Dilworth neighborhood. And, we’ve never turned back. We have more than 30 locations in the Southeast, and franchise opportunities for more. For more details, visit the official Brixx website.